Oman Air and Cargolux are to introduce a new destination in India with the introduction of two flights per week to Mumbai from 8th March 2016. The move is in line with a Joint Venture agreement signed by the two airlines in April of last year and follows the successful launch of joint cargo flights to Chennai. Flight CV6102 leaves Luxembourg on Tuesdays at 12.25 a.m. and is routed via Bahrain where it arrives at 8.05 p.m. (all times local times). Leaving Bahrain at 10.05 p.m., the flight’s arrival in Mumbai is scheduled for 4.05 a.m. on Wednesdays. The return flight, CV6113 leaves Mumbai on Wednesday mornings at 06.05 a.m. and arrived in Muscat at 07.00 a.m. before continuing to Luxembourg where it arrives at 12.40 p.m. The second service, CV6105 leaves Luxembourg on Fridays at 02.15 p.m. and is routed via Kuwait where it arrives at 10 p.m. Leaving at 11.30 p.m., It arrives in Mumbai on Saturday mornings at 05.40 a.m. and goes on to Muscat at 8 a.m. as CV6116. Arrival in Muscat is set for 08.55 and the flight arrives back in Luxembourg on Saturdays at 14.35 p.m.
Abdulrahman Al Busaidy, Chief Operating Officer of Oman Air said, “We are pleased to announce that Oman Air and Cargolux will offer a new twice-weekly cargo service between Luxembourg and Mumbai, starting from 8th March. The new service builds on the success of the second frequency to Chennai that we launched together in August last year. The new service will enable us to further strengthen our presence within the Indian market. “Our product advantages include the carriage of project cargo, livestock, cargo aircraft-only freight, odd size cargo, vehicles and aircraft engines. 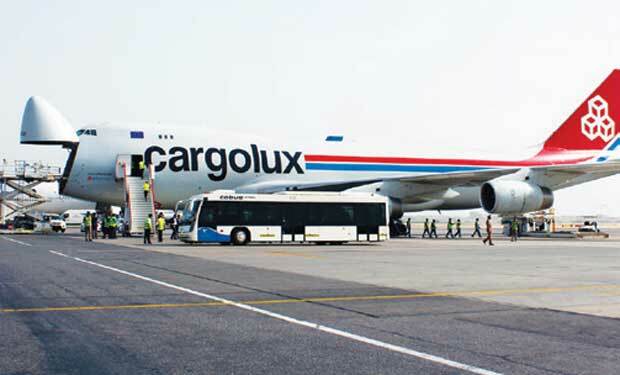 The new flights underline Oman Air’s and Cargolux’s leading role as providers of high-quality air cargo service into India. They offer fast and reliable connections to an ever-growing market that has witnessed increasing demand for import and export cargo capacity. Oman offers an attractive geographical location with established airports, increased cargo handling facilities and newly constructed sea-ports. The agreement provides Cargolux with access to the belly capacity of Oman Air’s passenger fleet, which operates to 11 destinations in India, as well as to destinations in East Africa. This gives the Luxembourg airline opportunities to feed consolidated freight to Oman from a number of larger markets. In addition, it enables Oman Air to further expand its cargo operation and build on the range of cargo initiatives and innovations the airline has introduced over recent years.